Chattanooga Whiskey's new location is under construction on Market Street across from the Chattanooga Choo Choo. Hours: Open seven days a week, hours yet to be announced. Galvanized by a rising tide of popular acclaim, Chattanooga Whiskey Co. altered an ancient Tennessee liquor law and rounded up support from local politicians and investors on their mission to build a monster distillery and tourist attraction in the Scenic City. But their efforts hit a roadblock when their first- and second-round picks for a distillery site proved unsuitable or structurally unsound. The once-raucous business quieted down and regrouped. Now, the self-styled Dynamo of Dixie is making noise again with the hiring of 33-year-old Grant McCracken, formerly head brewer and researcher at the Samuel Adams Boston Beer Co., as the new head distiller for the Tennessee Stillhouse. As head brewer in Boston, McCracken was involved in the production of more than 30 beers for Sam Adams that ultimately hit store shelves. He led development on close to 50 recipes, leveraging a long-time hobby into a full-time gig. The way McCracken tells it, he one day realized that he was better at brewing than he was at business consulting -- his previous career -- and so he went to beer-making school, joined the American Brewers Guild and worked his way up the ranks at Sam Adams after he showed a gift for creating desirable tastes. 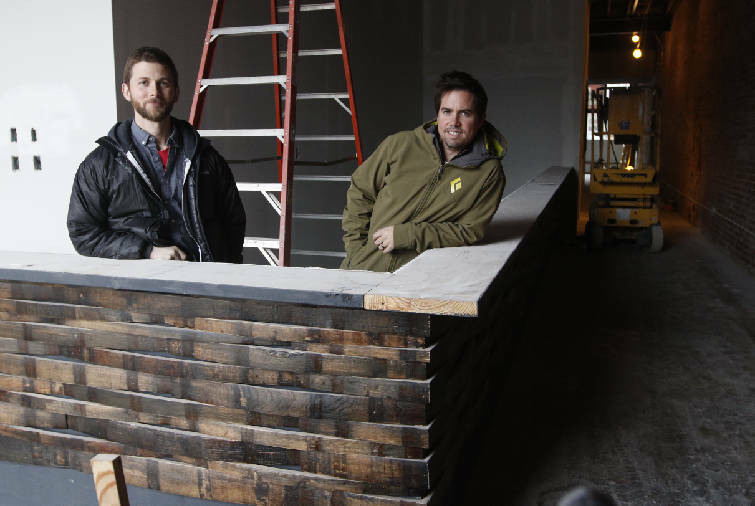 Tim Piersant, right, and Grant McCracken stand behind the bar at Chattanooga Whiskey's new location under construction on Market Street across from the Chattanooga Choo Choo. That's a skill that carries over to distilling spirits, Piersant said. "Our hope was to find somebody who was really innovative, but also had credibility in producing a well-known product," Piersant said. Distilling and brewing are closely related, and creative brewers are seen as a hot commodity in the world of distilling, company officials said. "The one cool thing about distilling is it takes a lot of patience, but it can also reap so many rewards over a long period of time," McCracken said. "With brewing, you're churning it out, you don't have your eye on the long game as much. I plan to be in distilling for the rest of my career." As the upstart company settles into a new, smaller location across from the Chattanooga Choo Choo, executives have tapped McCracken to imprint his expertise on what CEO Tim Piersant calls a "micro-experience." When complete, Chattanooga Whiskey will feature a distillery, retail space, tasting bar and patio. Instead of setting up a 2,000-gallon whiskey still in the 60,000-square-foot John Ross building, Chattanooga Whiskey has settled on a 3,000-square-foot retail location on the Southside that will feature a 100-gallon still. 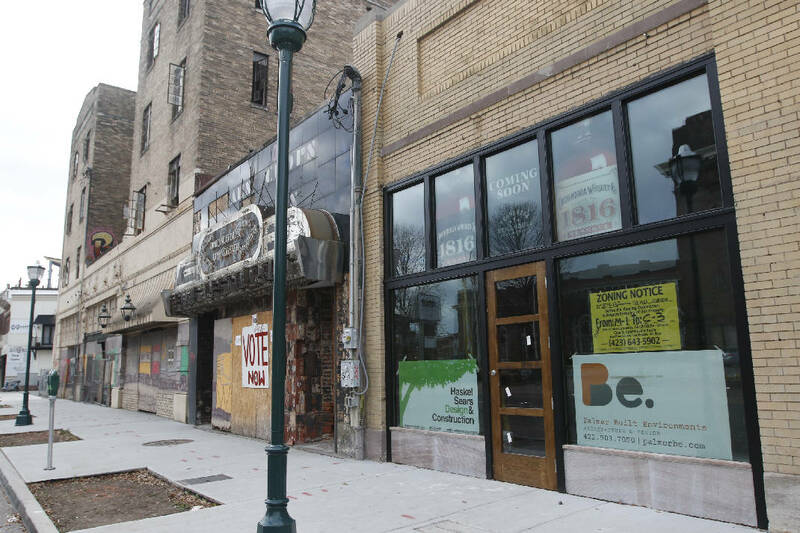 It's a significant downgrade from earlier plans at the John Ross building, but only a temporary pause on the road to a bigger location, Piersant has promised. The big still is still under construction, and Chattanooga Whiskey's backers are still in the hunt for a larger site that can support hundreds of stacked 500-pound barrels of whiskey. In the meantime, the micro-distillery will feature what the company calls a "grain to glass experience," complete with a retail store, a large bar for testing the company's products and handmade cocktails and tours of the small batch production process. The plan is to be open for business in February, an announcement that seemed to resonate with 500 visitors to a recent open house event during MainX24, which saw lines snaking out of the door and onto Market Street. An earlier version of this story mis-identified a brand of Chattanooga whiskey. The correct name is "1816." "The way I look at it, this is a different experience from what the John Ross building was going to be," Piersant said. "It's a great way for us to bring a product to fruition and build the team that we want to build, and for people to experience that on a very intimate level." The 100-gallon Vendome still will produce about 15 gallons of whiskey every four to five days. It doesn't sound like a lot, but then again Chattanooga Whiskey is still a small brand that sells spirits in only three states -- Georgia, Tennessee and South Carolina. Those small batches from the micro-still will give McCracken the chance to experiment with the tastes that could become Chattanooga Whiskey's next big brand, as the company slowly expends its supply of the 1816 product in existing markets. "You have a lot of opportunity to try something out, it's lower risk," McCracken said. "If you do a run that you're not crazy about, it's not the end of the world. In a large facility, we don't always have that luxury." Contact staff writer Ellis Smith at esmith@timesfreepress.com or 423-757-6315 with tips and documents.